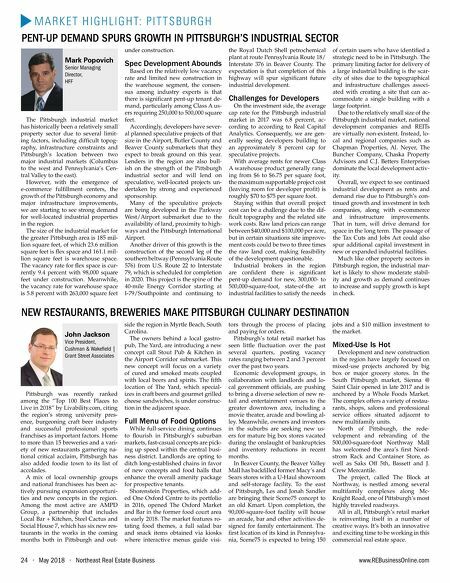 www.REBusinessOnline.com Northeast Real Estate Business • May 2018 • 25 M A R K E T H I G H L I G H T: P I T T S B U R G H The growing healthcare sector in Pittsburgh is expected to attract many higher-paying jobs to the metro area, driving household formation and leading to greater demand for apart- ments in the near term. The University of Pittsburgh Medi- cal Center, one of the largest hospitals in the region, announced plans for three specialty hospitals in the area after its competitor, Allegheny Health Network, late last year revealed its intention to open five more hospitals and facilities. The considerable num- ber of universities in Pittsburgh will provide a diverse hiring pool for the area's growing medical sector. From a historical perspective, low vacancy rates during the early years of the current economic recovery led to pent-up demand for apartments. Developers heeded the call, which resulted in an elevated number of completions in the past four years. The heightened pace of deliveries is expected to persist through this year as prospective tenants search for qual- ity apartments. The influx of new units will put slight upward pressure on vacancy. Investors Remain Bullish Relatively low vacancy rates over the course of the recovery motivated many owners to hold their properties, which limited the number of listings available and lifted average prices. The rise in property values above lev- els attained in the last real estate cycle may prompt owners to list their assets this year, particularly as buyers priced out of nearby East Coast markets are willing to pay a premium for quality properties. Investors are primarily targeting downtown assets, though the limited inventory has spurred buyers to ex- pand their acquisition criteria. Sales velocity has increased south of the ur- ban core and properties along major thoroughfares, including U.S. Route 19, have garnered significant atten- tion. Here, initial yields in the high-7 to high-8 percent range can be found. Metrowide, apartment assets are trading at an average cap rate of ap- proximately 7.5 percent, roughly 200 basis points higher than gateway mar- kets. Above-average returns will place Pittsburgh on the radar for many yield-seeking buyers. 2018 Market Forecast The projection is for employers to add 12,000 workers to their payrolls this year after a 1.1 percent rise in 2017. The unemployment rate has fallen sig- nificantly over the past year, making it difficult to find quality workers. The expectation is that developers will deliver 2,200 apartment units this year, up from 1,800 units in 2017. The 364-unit Riverfront Landing 1 in Cen- tral Pittsburgh is the largest project on track for completion in 2018. An an- ticipated net absorption of 1,700 units this year will not keep pace with the rate of new supply, however, which should result in the vacancy rate ris- ing 30 basis points to 5.3 percent by the end of 2018. In 2017, the apartment market in metro Pittsburgh achieved 5.4 percent annual rent growth. The outlook is for rent growth to moderate to 3.4 percent this year and for the average monthly rent to reach $1,115. In short, the booming healthcare industry will continue to generate housing demand near hospitals and employment centers. Look for height- ened interest from commercial real es- tate investors in those areas. 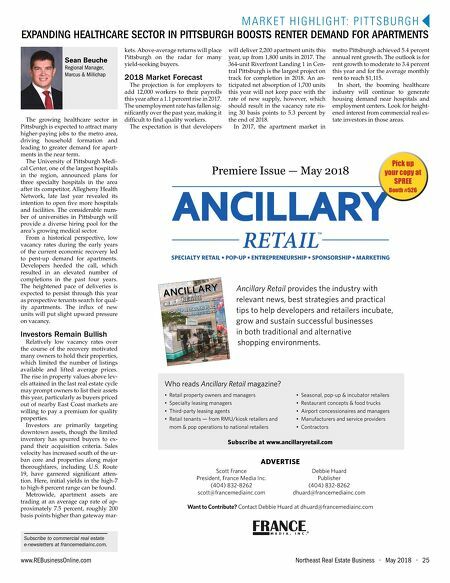 Sean Beuche Regional Manager, Marcus & Millichap EXPANDING HEALTHCARE SECTOR IN PITTSBURGH BOOSTS RENTER DEMAND FOR APARTMENTS ANCILLARY RETAIL SPECIALTY RETAIL • POP-UP • ENTREPRENEURSHIP • SPONSORSHIP • MARKETING TM POP-UP RETAIL IN PLACE TARTINERY AT BROOKFIELD PLACE NY Premiere Issue — May 2018 Ancillary Retail provides the industry with relevant news, best strategies and practical tips to help developers and retailers incubate, grow and sustain successful businesses in both traditional and alternative shopping environments. • Retail property owners and managers • Specialty leasing managers • Third-party leasing agents • Retail tenants — from RMU/kiosk retailers and mom & pop operations to national retailers • Seasonal, pop-up & incubator retailers • Restaurant concepts & food trucks • Airport concessionaires and managers • Manufacturers and service providers • Contractors Subscribe at www.ancillaryretail.com ADVERTISE Scott France Debbie Huard President, France Media Inc. Publisher (404) 832-8262 (404) 832-8262 scott@francemediainc.com dhuard@francemediainc.com Want to Contribute? Contact Debbie Huard at dhuard@francemediainc.com Pick up your copy at SPREE Booth #526 Who reads Ancillary Retail magazine? Subscribe to commercial real estate e-newsletters at francemediainc.com.